The more diverse your diet is, the more likely you are to enjoy overall improved health. This includes getting a variety of fruits and vegetables into your body every day. By exploring produce that comes from other countries, you can enjoy a whole range of health benefits and diversify your palate. These berries, which are small, purple, and about an inch in diameter, are native to Central America and South America. They look like a cross between grapes and blueberries, are sweet and tart, making them an excellent addition to any diet. Although you can eat acai berries as they are, they may be difficult to find, since they are not native to North America. You could probably find acai berries in larger grocery stores and health food stores, or farmer’s markets. They are easily perishable and getting them out of the Amazon may be a complicated process, therefore, they tend to be fairly expensive. To enjoy all the health benefits of acai berries, you should try to eat them in their whole form as often as possible. There is a high likelihood that the fresh berries may not be available to you, so the supplement form is probably next best. Immune system protection: The high antioxidants content found in acai berries help your body naturally fight off colds, viruses, and other bugs. It is especially helpful during the winter months, when illness seems to run rampant. Cancer prevention: Some studies have linked acai berry consumption to a lower risk of several types of cancer. In an age where cancer seems to be one of the most common health problems in the world, anything that can lower your risk is worth trying. Digestive health: Eating acai berries aid in keeping the digestive system clean and in optimal health. It is helpful in preventing digestive upset and keeps your digestive system regular. High levels of antioxidants: Acai berries are naturally rich in antioxidants. Antioxidants destroy free radicals in your body and slow the growth of cancer cells, offering your body natural protection. Promotes skin health: Many beauty products are using acai oil as one of their ingredients due to its high antioxidant content that works as an anti-aging agent. Consuming the berries gives your skin an extra boost of healthy glow. 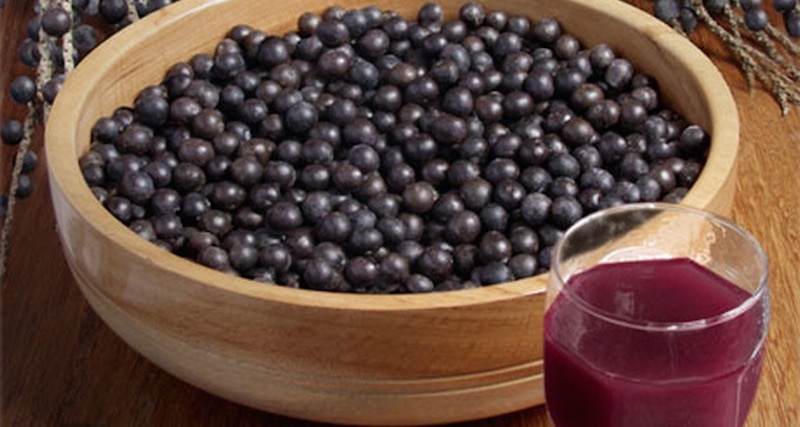 Weight loss: Many experts believe that acai berries can help in weight loss efforts. In fact, that is why this fruit became so popular in the United States— it was used in many popular weight loss supplements. Energy boost: Taken over time, the healing that takes place will increase your overall level of energy and stamina, fighting fatigue and exhaustion. Improves mental function: Eating acai berries, whether fresh or in supplement form gives you the benefit of improved blood circulation that allows the blood to bring oxygen to the brain, thus improves the brain alertness and optimum mental function. Eye health: Like most berries, the high antioxidants level in acai makes it an excellent food that protects eye health, and possibly correct borderline short/long-sightedness. Drinking the juice of these berries is a good way to enjoy their nutrients and support your immune system. If you buy the fresh, raw acai berries, you can make them stretch a little further by juicing them with other berries, apples, kiwis, and other fruits. Since acai berries can be fairly tart, you may want to juice them with other berries to offset their natural tartness. Just a few acai berries a day can help you enjoy all that this fruit has to offer and diversify your diet. That is how concentrated it is, as a nutrient powerhouse.